A few more strips out of my scrap drawer! I started by sewing together the four strips which I used for the butterfly. Then, I could not think of anything to do with that little strata. I cut it in rectangles... Nothing. Instead of thinking 'blocks', I started thinking 'shapes'. That is when I thought of butterfly wings. I traced triangles onto Heat'nBond paper, ironed them onto the back of the strippy rectangles, pulled the paper off and used scissors to shape the edges of the wings. I drew the butterfly body onto same paper, found a dark strip of fabric, and the rest is history. 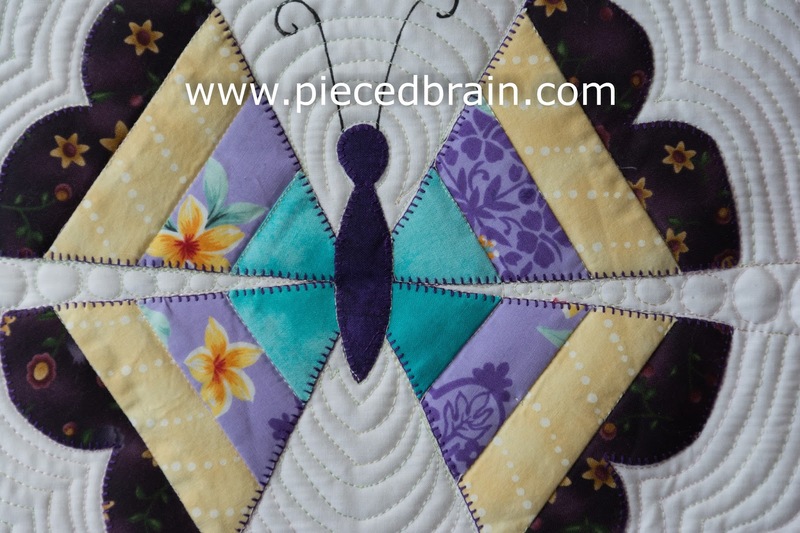 Do you see the Hawaiian fabric on the butterflies and on the center strips? They are leftovers from a Hawaiian top I still need to quilt. They will pop up again on another Strip-easy Quilt Challenge project I am working on. Anyway, I hope this table runner will get you thinking about other ways to use the fabric strips you have. I am excited about all of you who have decided to join this Strip-easy Quilt Challenge. There is still lots of time to join in the fun! I will continue to post projects I am making with my strips to get everyone inspired. Get your projects ready and join the linky party here on May 26 to show everyone what you created. Can't wait!!! After using our already cut strips in projects, I am sure we will feel much better about purchasing the fabrics we have on our list (as if we needed excuses...)! I am now linking to Freemotion by the River for the Linky Tuesday party. Check it out and enjoy the day! Hope this isn't a duplicate comment, I think mine disappeared! Beautiful table runner and love the butterflies! Thanks for sharing. It`s abolutely fabulous and the butterfly caught my eye!! Love the table runner and the echo quilting really makes the wings flutter.